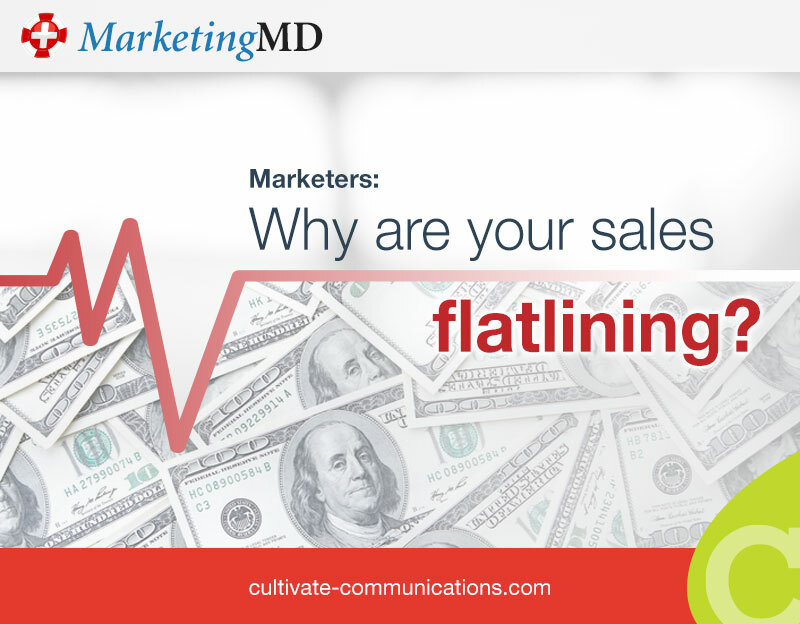 Marketers: Why are your sales flatlining? Why aren’t traditional sales approaches working as well today? A growing body of research sheds some light on what has changed. It used to be so easy: Generate sales leads, work the pipeline, overcome objections and close sales. Now, everything is different. It’s much harder for your salespeople to get face-to-face appointments. Prospects want to do their own research and product comparisons. They don’t want to talk to you until just before the sale. As a result, sales are stagnant. Your company needs growth – now. Research from CEB’s Marketing Leadership Council and Google shows that business buyers do not contact suppliers directly until 57% of the purchase process is complete. That means for nearly two thirds of the buying process, they are forming opinions, gathering technical specifications, building requirement lists, and narrowing down their vendor options – with little or no influence from you. Why is this a problem? By the time a prospect makes contact with your company, “they have hardened expectations about what they want out of a supplier – and at that point, your job is to take their order and fill it for the lowest price. They’re learning on their own, and there’s no room to teach them why what they’ve taught themselves is wrong. It’s marketing’s job to influence the 57% of the sale that occurs mostly on the web, before sales contact,” the report adds. As a result, research conducted by Forrester Consulting suggests that the traditional role of the sales representative is declining. Only 20% of buyers purchase directly from a sales representative more than half of the time, and phone or email customer service is lagging at 17%, too. During the past two years, the B2B research process has changed, according to a study Google conducted with Millward Brown Digital: “While 64% of the C-suite have final sign off, so do almost a quarter (24%) of the non-C-suite. What’s more, it’s the latter that has the most influence; 81% of non-C-suiters have a say in purchase decisions. Clearly, if you’re marketing only to the highest level, you’re overlooking the people who need to notice you,” the report states. It also reveals that millennials are taking a lead role in B2B purchase research: In 2012, the age of researchers was more or less evenly spread out across age groups. In 2014, however, 18- to 34-year-olds accounted for almost half of all researchers, a remarkable increase of 70%. While they may not be the decision-makers yet, they’re starting to take a stronger role in the B2B purchasing process. Remember – they’re digital natives, with high expectations for online experiences! If you’re struggling with flat-lining sales and need to spur sales growth, contact us to learn about our profitable alternative: Growth Cycle Marketing.